And Miss Amsterdam 2018 is…. Janice Babel!! After an dynamic show we witnessed the crowning of Janice as the new Miss Amsterdam 2018. 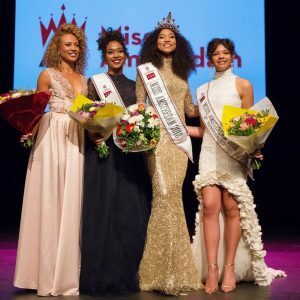 She was crowned by Ireda Neijboer, Miss Amsterdam 2016/2017. Janice will now be prepared by Robin and Stefan of 12 Months of Beauty for her international challenge, the Supermodel International competition in Bangkok Thailand later this year. Last but not least, Cherokee Chin Joe Kie, who didn’t make the first cut during this dazzling final night showed us how someone can improve so much from the casting till this final night, really impressed us. One of the most fun part of the show was the national costume competition where the girls had to show a costume from the country the feel the most attached to. It was a mix of colors and great poses. Every round all the girls gave it all and in the end there were no 5 but 7 finalists as the judges could not pick only 5. Robin from Miss Holland Now was one of the judges as was Miss Holland 1984, Nancy Neede. we would like to thank Marjorie de Cunha for her trust and congratulate her for a job well done! !